An evolution zealot named Stunted wanted to challenge me regarding my video about the Smithsonian cheating on their hominid models. The Smithsonian makes the craniums on the hominid models much larger than the skull craniums the models are supposedly modeled after. They also give them large foreheads so they look like they have large prefrontal cortices, a human characteristic. Stunted presented me with a series of photos of an A. afarensis model being made (above) so I could see how they REALLY DON”T CHEAT. How I am so wrong. Well, his own modelers cheated on their own model in such an obvious fashion, it’s really hard to believe. It seems like I am the only person on the planet checking on this, and catching them at their dishonesty. What kind of science would do this? Let’s hope it’s only evolution and no other major sciences. Below is a note I wrote to Stunted. OK , here you go Stunted: Here are the first three steps on your famous picture with three different fossil skulls placed and CAREFULLY proportioned over them. I used the chin to top of scalp dimension to get it JUST RIGHT for you. Now don’t be saying I cheated, or disproportioned the models or skulls in any way. You can easily test this yourself. But you won’t. Too embarrassing for you. (1) Is the actual skull USED BY THE MODELER WHO MADE THIS MODEL. It’s step one in your picture. I put the skull used by the modelers over their second step. See how large the cranium has become from step one to step 2? They have already cheated. It’s increased by at least 30%. Just think. Your own picture catches them cheating. I don’t know where this model came from. Not the Smithsonian. Please let me know. So you and I have caught another cheater. Congratulations to us! (2) and (3) are fossil skulls made with the actual bones found of Lucy (A. afarensis). Of course, filled in by expert modelers. I used two different “fossil” skulls as well as the skull used by your modelers. Got it? They are cheats. They have you fooled. But you will think of an excuse, and continue to be fooled. You want it that way. I fully realize you are completely programmed, you will make some absurd excuse, and continue with your indoctrination. I can’t wait to hear just what that excuse will be. It’s what evolution does to people for some crazy reason. Which makes this a complete waste of my time. “This isn’t even worth the long response I had planned for it. Do YOU see any cranium being added there Stevebee92653??? Or is that jaw muscles?? Some apes do have rather bulbous jaw muscles. At left is a chimpanzee with an overlaid chimp skull. At the bottom of this page is an explanation of how I proportioned the skull over the chimp. You can see that the jaw muscles contribute little to the size of the cranium area of the head. Obviously, the bulbous jaw muscles on the top of the skull cannot come close to accounting for the greatly exaggerated foreheads and craniums that modelers use on their faked models. Further, their models have human skin, human eyes, human hair, human expression. They are nearly human. Giving them bulbous temporalis muscles as if they were 100% ape when they are supposedly 90% human is part of the con. Their temporalis muscles should be 90% like that of the human skull above. They should be cardboard thick. Not extremely bulbous and 100% ape. The modelers give their models 100% human skin, 100% human eyes, 100% human hair, human expressions, and 100% bulbous ape muscles? Does that make any sense? Or are they trying to fool? 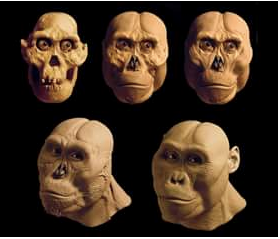 Of course, if they are nearly human, yet they still have muscle bumps covering their craniums, that would mean their craniums haven’t evolved to become gradually larger as they should so they can become 100% human. The craniums on the hominid models would still be tiny under their bulbous muscle layer. Ah, so you can’t even see the extra cranium added? What a laugh. So the modelers used the excuse that they added big fat jaw muscles to account for their massive scam craniums? Feel your own head and see how fat your temporalis muscles are. You are blinded by your belief. If the cranium were 100% larger on the model you wouldn’t see it. Or 200%. It matters not, which makes discussion with you an absurd waste of time. Every person I showed your montage to immediately saw the cheating without me having to place the skull over the second step. It’s so completely obvious. You didn’t understand population problems, you can’t see gross cranium fraud in your own picture. You can’t question. You only believe. Sad. “Muscles is not added cranium. You still fail to show where extra CRANIUM was added. Whoever you showed it to (which I doubt you did) can’t tell the difference between cranium and jaw muscles. And large jaw muscles is more of an ape feature, not a human one. Its like you looking at a gorilla skull next to a model and saying “hey hey hey, look how they added cranium to make the Gorilla head look larger”. And that’s the end of Stunted’s chance to comment here. His response is exactly as I had predicted. Excuse after excuse, instead of ever questioning or even discussing rationally. That’s the strange effect evolution has on people. Once the belief sets in, there is no questioning or wondering or doubting. That is gone. Sadly. For the fun of it, I took two models made by the Smithsonian, H. erectus, and H. heidelbergensis. I oriented two of Stunted’s touted 3-D models laterally so their dental arches had about a 10 or 15-degree rise. I turned them to face front and took images. I triangulated the distance between the iris of the model’s eyes and the incisal edges of their incisors. I then matched the triangulation on the models with the triangulation on the eyes and teeth of the fossil skulls. I placed the fossil skulls over their corresponding models. It’s easy to see that the modelers didn’t use the fossil skulls at all in making their models. The models aren’t remotely close to following the fossil skulls. Adding or subtracting large jaw muscles matters not. The models are fakes. They fool people like Stunted to believe that we came from apes when that notion is as absurd as the notion hummingbirds, chickens, and all birds evolved from T. rexes. And that little 20 lb. fox-like animals evolved into 400,000 lb. 100 ft. long blue whales.